Consort anthems by Orlando Gibbons, a world-premiere of music by Christopher Simpson, and sacred vocal consort settings by Thomas Tallis. I. 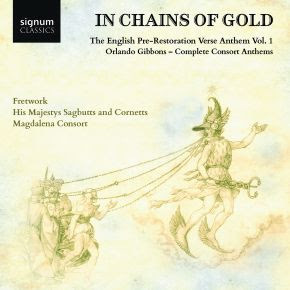 In Chains of Gold—The English Pre-Restoration Verse Anthem, Volume 1 (Fretwork/His Majestys Sagbutts and Cornetts/Magdalena Consort). Signum CD SIGCD511. Leading performers of 17th-century music Fretwork, His Majesty’s Sagbutts and Cornetts and the Magdalena Consort (directed by Peter Harvey) combine forces under the artistic direction of William Hunt for this first complete recording of the consort anthems of Orlando Gibbons. Gibbons’ music is one of the artistic glories of the first Stuart reign. Amongst his sacred compositions, verse anthems such as This is the record of John and Behold, thou hast made my days are long acknowledged masterpieces, amongst the greatest in all English sacred music, but best known to most in their setting for choir and organ. Here they are presented together with an array of other great anthems, some of them scarcely known, in their more intricate and colourful versions for consort accompaniment.Following the instruction of such contemporary writers as Morley and Caccini, these radical new performances place communication of text at the forefront, seeking to rediscover the dramatic essence of the verse anthem that made it arguably the most effective musical creation of the English Reformation. With the incisive declamatory skill of several of the UK’s leading period performers, they reveal the extraordinary rhetorical and poetic power of this music, as it might have been heard in the Chapel Royal and the private domestic chapels of early 17th century England. From Gramophone: Don’t start playing this disc at the beginning. Skip straight to track 3 and Gibbons’s first In nomine a 5, and listen to the blanched brilliance, the glistening cobweb delicacy of tone from Fretwork’s viols. If something feels unfamiliar, electric almost in its charge, then it’s down to the tuning, which puts the consort up to the perilous heights of A466 for this recording – a ‘perfectly likely tuning’ for this repertoire, according to a booklet note by the album’s artistic director William Hunt. The effect, in the three In nomines recorded here, is of uncanny beauty, familiar notes polished up to a new sheen and lustre. This innovation alone makes ‘In Chains of Gold’, an album of Orlando Gibbons’s consort anthems (Vol 1 of a planned set), worth investigating. Whether you’ll choose to return quite as often to the anthems themselves is another matter. Fretwork are joined here not only by His Majesty’s Sagbutts and Cornetts – lending some burnished colours and glowing contrapuntal detail to ‘Great King of Gods’, ‘O all true faithful hearts’ and ‘Lord, grant grace’ – but also by Peter Harvey’s Magdalena Consort. This ensemble matches Fretwork’s authentic tuning with intimate forces, whose upper voices include not only trebles and means but also contratenors, taking lines more usually sung now by altos. But among such few voices any blots are keenly evident, and the now acid-toned and lumpy tenor of Charles Daniels blurts out too often for comfort. His solos in ‘Behold, thou hast made my days’ and ‘Great King of Gods’ lurch in and out of focus, distorting the clarity and shape of Gibbons’s lovely lines. It’s a tendency that proves catching, and while there are some fine moments (especially from the basses), these anthems lack the character and sustained beauty of rival recordings. II. Thomas Tallis: Queen Katherine Parr & Songs of Reformation (Alamire/Fretwork/David Skinner). Obsidian CD716. Thomas Tallis was active across the reigns of Henry VIII, Edward VI, Mary I and Elizabeth I. He famously mastered all forms, old and new, as dictated by the changing religious landscape in 16th-century England. He died in 1585, very ancient and celebrated, and today is acknowledged widely as the Father of English Church Music. This is a recording that not only demonstrates his consummate skills in many genres, but one of new discoveries. Featured among these is the first recording of an early version of his grand six-part Gaude gloriosa dei mater, but with words by none other than Henry VIII’s last wife, Queen Katherine Parr. From The Guardian: Picture a scene of domestic bliss: it is 1544, and while Henry VIII is planning another battle with France, his sixth wife Catherine Parr is writing English words for an anthem rallying support. Was she mindful of the fact that the last wife who displeased Henry had her head lopped off? Parr's text, calling down thunderbolts and whirlwinds on the enemy and set to music by Thomas Tallis that he adapted from an early version of his anthem Gaude Gloriosa, was bloodthirsty enough to please the king. Alamire’s all-Tallis disc is fascinating not only for this anthem, Se [sic] Lord and Behold – it was discovered by the choir’s director, David Skinner, two years ago – but also as a document of some of the earliest liturgical music set to English texts: church music as anti-French propaganda. Alamire’s clean-toned delivery makes every word speak, and Fretwork’s viol consort pieces set the choral works effectively in relief. III. Christopher Simpson: Ayres & Graces (Chelys Consort of Viols). BIS CD BIS-2153. From MusicWeb International: Brian Wilson reviewed this recording as a download, referencing some earlier recordings of music by Christopher Simpson and providing some interesting further places to explore. I have to admit knowing nothing about Simpson before now, though there does seem to be something of a renaissance in taste for the viol and viol consorts in the variety of recordings appearing from numerous quarters. Christopher Simpson's life has left little in the way of written records, so we have few details other than that he was a quarter-master for the Earl of Newcastle, who was on the Royalist side during the English Civil War. His theoretical treatise 'A Compendium of Practical Musick in 5 parts, teaching by a New, and easie Method' has survived and was first published in 1665. Purcell considered it 'the most ingenius book I e'er met with upon this subject'. Alex Parker has transcribed the works heard here from a variety of sources, and it his booklet notes that guide us through the background to the music. Ibrahim Aziz provides notes on the recording, including the choices for continuo and aspects of ornamentation. Using copies from English instruments from the first half of the 17th century with gut strings, this has to be considered as a close approximation, and possibly a highly accurate reflection of the kind of sound Simpson and his audiences would have enjoyed. Either way, the sound is rich and colourful, with superbly intonated harmonies, nicely natural-sounding phrasing and plenty of contrast between the slower music and those propelled by gentle dance rhythms. Instrumental colour is also treated to subtle contrast, with the baroque guitar adding rhythmic liveliness to something like the Divisions in A minor on track 9. The chamber organ gives depth to the harmonic fundamentals in the slower music, over which the viols can play expressively and with their more upper-harmonic rich spectrum. Simpson is not as adventurous a composer as his contemporary William Lawes, but this release would make a fine companion to the excellent recording made for Linn records by ensemble Phantasm (see review). Recorded in a suitably airy but not too large acoustic, there's a very slight 'rumble' you might notice just before the music starts, but beyond that the quality is excellent. This debut recording from the Chelys Consort of Viols is easy to love and is warmly recommended.